Notes: A dogwood with gorgeous blue berries. It tolerates wet swampy ground and less wet conditions too. Photographs: 118 photographs available, of which 10 are featured on this page. SCROLL DOWN FOR PHOTOGRAPHS. An entire plant. It grows in damp or wet areas. Upper surface of a leaf. This stem shows the silky hairs which give this shrub its common name. The stem of Silky Dogwood has these markings on it, which are absent from Red Osier Dogwood (Cornus stolonifera) bark. 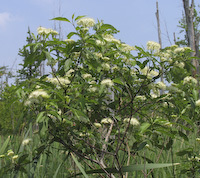 The pith of Silky Dogwood distinguishes it from the similar Red Osier Dogwood (Cornus stolonifera), whose pith is white. Silky Dogwood plant in the fall. Cluster of Silky Dogwood ripe fruit. Flowers just starting to open.